California Adventure's Food and Wine Festival is back for the first time since 2010, and it's delicious! I wasn't expecting to be able to see (or taste) it on my last trip since I was only going to be in the park on week days. 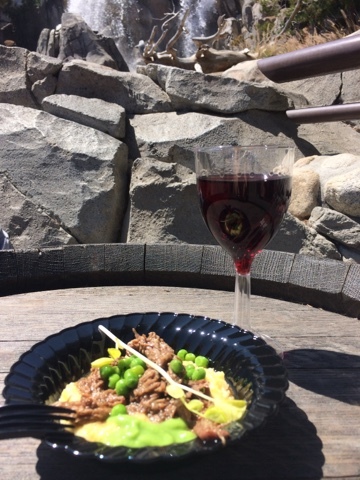 Imagine my excitement when I was walking the parade route (between Cars Land and Paradise Pier) and found it lined with stands selling delicious small plates and wine. My husband and I got the kids hot dogs from Award Wieners (not my fave, but I'll save that for another blog!) and then walked through the Festival Marketplace to pick our special lunches. I went to the Wine Country stand where I had an amazing Zinfandel Braised Waygu Beef, served with polenta and puréed peas. So delicious!! I chose one of the MANY wines they offered for pairings. It was so good, I don't even know where to start! I just wish the plates were bigger, or that I had ordered more than one thing. Next time! 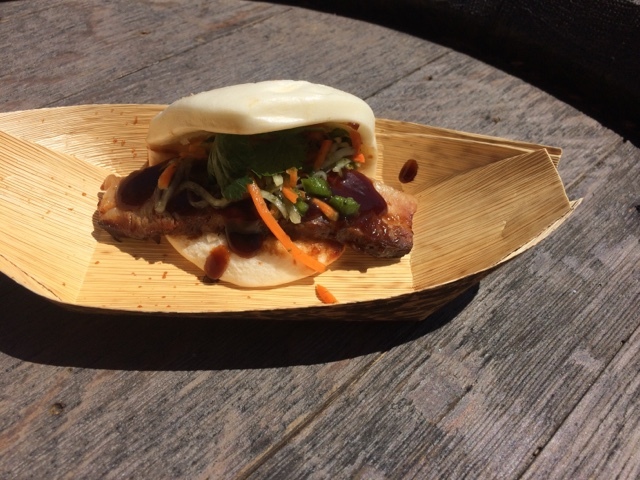 The hubby went to LAstyle for the Pork Belly Bao Taco. He was in love! Later on that evening before lining up to see World of Color, I went back to check out a dessert. 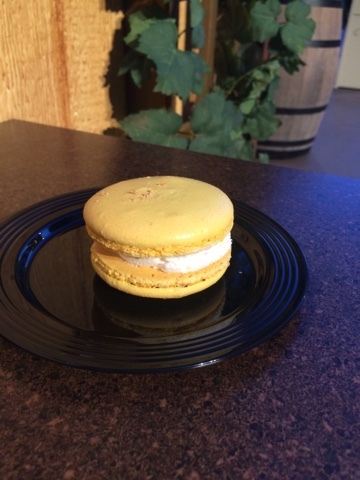 I chose the Meyer Lemon Macaron from The Farm. It was amazing...until I got to the blueberry jam filling. That was very weird. But then again, I'm not a jam fan. If you are, I'd highly recommend it. There were almost too many places and options to choose from. I wish I was local so I could come back every weekend to try it all. 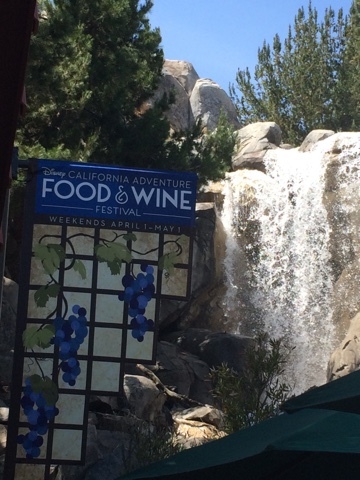 The Food and Wine Festival has lots of other activities, every Friday - Sunday in April. Like I said, I missed out on the weekend fun. But I checked out what was available so I could report back to all of you! 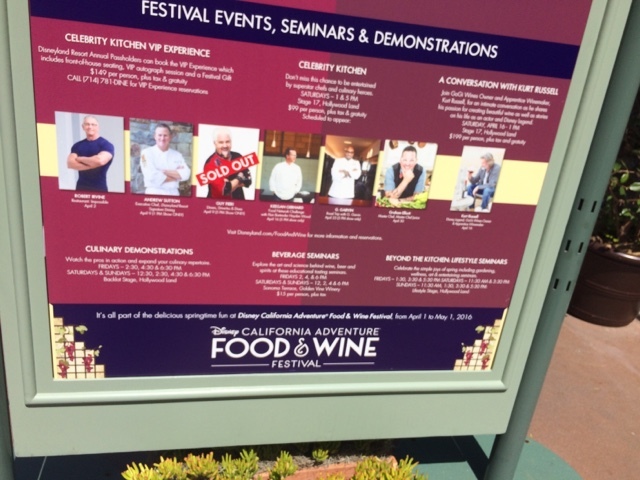 The stage in Hollywoodland has free culinary demonstrations (no tasting, unfortunately) and "lifestyle seminars" about healthy and sustainable eating. There are beverage seminars that cost $15 a person and require advanced reservations (which are totally booked up as of the time I'm writing this). And last but certainly not least are the celebrity appearances, ranging from $99 - $200 depending on who you want to see and if you'd like special seating/autographs, etc. And don't forget the merchandising!! 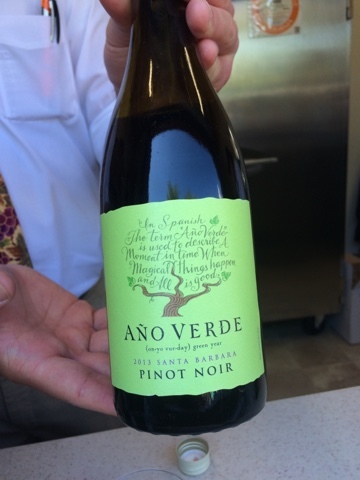 Have any of you gotten to taste something fantastic at the Food and Wine Festival? Tell us all about bout it in the comments!